Now, I always believed that a majority of the behavioral problems that accompany separation anxiety could be solved with training as well as mental and physical exercise. I was very wrong. I don't know what else to do for this poor girl... I spoke with wolf dog rescues and breeders around the country but no one knew how else to help me... I love her to bits and pieces but gosh, I don't know what else to do. These are the different things that we tried. We have tried both these alone and these paired together. NOTE she has two other dogs in the home (Australian Shepherd and Standard Poodle) and she is VERY bonded to the Aussie. She is NEVER left without him. We first left her home we returned to urine everywhere, destroyed blinds, a ruined couch, and a scratched door. We began to crate train her. We left cameras up around the house with a live feed so i could watch her and come home if she was in danger of herself. She BENT the bars and squeezed out through a kong brand wire kennel. She nearly strangled herself i the process! That wasn't going to work. We put her on medication but little improved. We put the thundershirt on and we saw some improvement with that. We left the radio on for her and kept everything dark. We put her in the basement with the thundershirt, medication, and radio. She broke through the window TWICE and destroyed two doors... I don't know what to do. Not only is she destroying my home but she has injured herself multiple times while she desperately tries to escape. But when i am home, she is an angel. She sits at my feet and sleeps, she doesn't get into anything, she doesn't ruin anything or have accidents. She is completely perfect... until im not there. I try to take her everywhere with me but i cant... i don't know what else to do. I feel so terrible because i can only begin to understand how terrified she has to be to behave in such a manor. Does anyone have any ideas that we haven't tried?? First off, it is wonderful she has a pack of dogs to be with. Their calmer energy will help her a lot. Dogs are very perceptive to our emotions, whether we try to hide them or not. But sometimes, no matter how calm and assertive (as we should be as the pack leader) we are, they have learned a behavior do to past stress. First, how much exercise is she get? Wolf-dogs are a huge commitment because they need a hour long walk daily, no matter the weather (rainy, snowy, windy, ect). This is a lot of work. If they can't be walked this often, they need at least two acres of room to run around on to get their energy out. Our pack as two acres fenced in. However, a wolf-dog could easily escape from our yard. If a dog is exhausted, they will not destroy a home. Here is a method I heard of. Set up a video camera and step out of the house. Ignore her when she reacts badly but if she shows any moment of calm rush inside and congratulate her. I watched this work like a charm on a dog with separation anxiety, after a few days of this, to the point where it remained calm for hours on end. So my best suggestions would be to work out all the energy you can with a long jog or hike (at least an hour) until she is so tired she just wants to sleep. Then slowly work on leaving for longer and longer times. When you come home, try to keep it calm. If she rushes to you for comfort, tell her good dog but remain calm and friendly, instead of getting her my hyper. Keep your own energy calm and she will feel as though her pack is stable and will want to copy it. How are the other dogs as far as behavior goes? If your aussie has a lot of energy then Tundra may be feeding off of its energy, as I hear aussies are very energetic dogs. I'm not sure how your basement is set-up, but if you want her to stay there while you are gone, try making her a den so that she feels completely safe in it. Put something that smells like you in it, such as one of your old sweaters or a blanket, and keep the other dogs down with her. Try playing a radio or soft music so she can hear human voices and feel more secure. I hope these methods help, as she sounds like a very sweet dog. In her blood is the energy to run miles every day, with her pack always at her side, but wolf-dogs can and do learn. Continue to be patient and understanding and I really hope she begins to calm down. Do you have any sort of outdoor enclosure for her? You kind of can't keep a wolf dog indoors 24/7, regardless of content, especially when you're gone. They will destroy everything. Sarajeku, also a wolf dog owner, will tell you the exact same thing if she reads this post. If your dog is a mid content, then keeping her indoors 24/7 is not going to be healthy for her. Wolfdogs have tons of energy and need an outlet and a secure outdoor enclosure. My low content is not happy being inside all day long and has to be outside for at least a few hours a day. 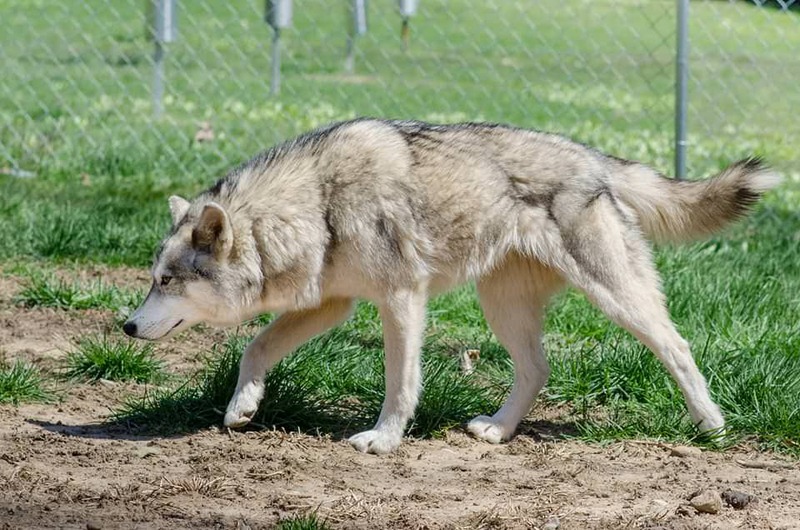 A 7-8 foot fence with a dig guard is the minimum for a wolfdog, in my opinion. Wolfdogs are notorious escape artists. Kismet (my low) is an escape artist. Also keep in mind that wolfdogs are VERY smart. They will learn what they can and can't "get away with" and will test their boundaries (especially when you're not looking). Personally, I don't recommend wire kennels of any brand for a wolfdog. I use a heavy duty airline kennel for Kismet. She has anxiety and she pees in it, but it is better than hurting herself or eating something she shouldn't. Kismet is very sensitive to foods which is common in wolfdogs that she isn't used to eating so if she is left alone in the house, she will eat everything she can put into her mouth. She HAS to be supervised inside because she is very destructive. To start to understand, think about what she has been through. That means 3 other people that she trusted and loved gave up on her. Likely, she is worried you will be no different. Do you have a picture of her?? I'd love to see what she looks like! This is my Kismet. She's F4 35% low content (7 and a half months). I have a, what I think is, a mid content wolf hybrid. I have had him for 5 and a half years, he is 130 lbs. I have dealt with some of the same issues. He cannot be left in the house alone, when I have tried, he has taken down blinds (that face the direction I left), or scratched up doors. I have watched him on a camera when I leave, he walks around howling, staring out windows in the direction I left, and is very anxious. The one time I left him alone out, he chewed up the door a little and took down a pair of blinds in one of my spare bedrooms.. The only time he was able to be left out when I left was when I lived with 4 other people; someone was always home. As long as someone was home, everything would be okay. Now that I live alone with my girlfriend, someone is not always home, so he is forced to stay in the kennel when that happens. Mind you, I don't have an ordinary kennel. I had to have one made by a welder. it's solid steel and weighs about 300 - 400 lbs. Outside of the behavior when I am gone, he is one of the smartest, most well mannered, best dogs I've ever had. He is great with all types of people, kids, babies, and animals (dogs, cats, snakes, rodents, etc. ), just not so great without any people at all. I put alot of work and time socializing him with different kinds of people, animals, dog breeds, etc. when he was growing up, and that has paid off. For those who say that a hybrid cannot be an inside animal, you are wrong and I am proof. Mine prefers to be inside and is a very relaxed dog, and he is not a low content ( I could be wrong, you tell me ). But I can honestly say, without the kennel I had made, I would not be able to keep him. Love him to death, but he is a handful. My 5.5 years of experience and trying different things says you have two options. Get a kennel made by a welder, or create an enclosure outside that can take the stress of holding the animal. I don't think mine will ever grow out of the anxiety and I will likely have the kennel until he is gone. I won't claim to be an expert, by any means, and I don't like to pheno (especially from pics) so I won't say for sure whether or not your animal is a mid, but from what I can see of your pictures, he doesn't look like a mid to me. But again, I don't really like to do phenos from pics. I prefer hands on. What I will say, is size is not an indicator of wolf content. That is a very common misconception. Extremely large size like you describe is generally a dog trait (such as alaskan malamute). In general, wolves are more tall and lean, rather than heavy and bulky. Since it appears my old pics aren't showing up anymore, here is a picture of my low content. With embark and new lineage info, she is right around 30% F4 (4 generations away from pure wolf) and phenos a solid low content.